The universality of the proverb above is the reason why, as investment advisers and family office to several generations, we view it as one of our primary missions to help our client families avoid the “curse of inherited wealth”. A good place to start is to try and avoid speculative bubbles and their fortune-destroying aftermaths. The history of investment markets is punctuated by the building and bursting of speculative bubbles, often accompanied or followed by economic recessions. Avoiding these dangerous periods should be a major goal of investment for the long-term growth and protection of family patrimonies. In spite of this, after hundreds of years of experience, eliminating the impact of bubbles from truly long-term investment performance remains more an art than a science. Contradicting this natural tendency to blame, one of the originalities of Hyman Minsky’s Financial Instability Hypothesis was to state that “the financial system naturally swings between robustness and fragility and these swings are an integral part of the process that generates business cycles.” The booms and busts that tend to accompany these swings are thus inevitable in a so-called free-market economy and do not need an external trigger, such as policy error, natural disaster or war, to occur. (2) So. Where should we watch for potential bubbles? In recent years, this view has been reinforced by work from a newly-popular branch of psychology, behavioral investing, whose researchers hope, one day, to develop precise indicators of irrational excesses of greed or fear that would tell us when to buy or to sell financial assets. Unfortunately, those kinds of signals are anything but precise. The professionals’ favorite tool to detect bubbles probably remains valuation, of which one of the simplest and most widely used form is the price/earnings ratio (P/E). Two groups have contributed to the upward pressure on stock prices and thus P/E ratios. By buying in their own shares on the stock market, companies reduce shares outstanding and thus boost reported earnings per share, though at the expense of increased balance sheet leverage (equity and cash shrink, while debt does not), so that there is a limit to this trend. 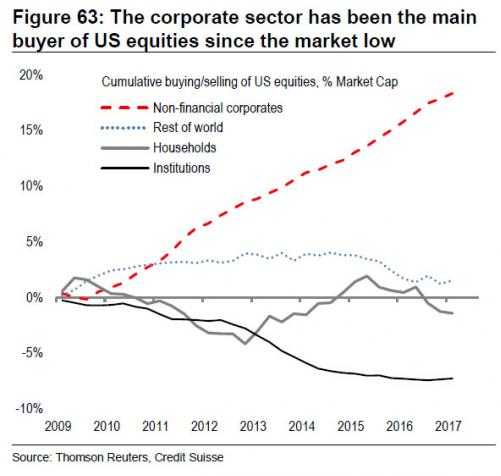 As can be seen on the following graph, corporations have been the most aggressive buyers of their own shares since the stock market low in 2009. But, as if ultra-low interest rate policies were not enough, central banks now have begun to aggressively acquire common stocks directly. Bloomberg (08-04-2017) reports that large-capitalization stocks have risen six times as fast as smaller companies in the Russell 2000 Index. The advance in mid-size companies is about half the S&P 500. “In the current up-cycle, over-weighted, liquid, large-cap stocks have benefitted from forced buying on the part of passive vehicles, which don’t have the option to refrain from buying a stock just because it’s overpriced. Valuation measures may not be ideal timing indicators, but when one compares the price of a stock or of an index to a single figure like its last twelve months’ earnings, there is no escaping the logic that the higher the ratio, the more optimistic investors are. Amazon’s 1997 letter to shareholders states: “We established long-term relationships with many important strategic partners, including America Online, Yahoo!, Excite, Netscape, GeoCities, AltaVista, @Home, and Prodigy”. When an economy is perceived as stable, people become optimistic. When people get optimistic, they pile on debt in an effort to increase their returns. When they pile on debt, the economy becomes unstable. He goes on to quote a comment from a leading strategist about the return of Argentina to the bond market after five defaults in the last hundred years (one in the last five): “It’s just shocking that they exit default and their bond issue is a century bond”. Nevertheless, the strategist was advising her clients to buy the bonds “at least for a short-term trade”. In his blog article on bubbles, Morgan Housel adds a dimension to the definition of bubbles by bringing into the discussion the time horizons of various investors. 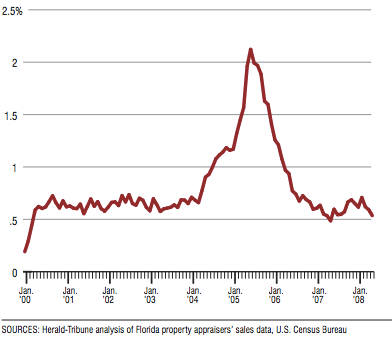 The following chart shows the percentage of Florida home sales whose previous owner held the property for less than six months. “It’s hard to justify paying $700,000 for a two-bedroom Miami track home to raise your family in for the next 20 years. But it makes perfect sense if you plan on flipping it in a few months into a liquid market with price momentum… You can say a lot about these investors. You can call them speculators. You can call them irresponsible. You can shake your head at their willingness to take huge risks. But I don’t think you can call all of them irrational. Successful long-term investing is primarily about understanding your own time horizon and not being persuaded by the price actions caused by people with different time horizons. I believe that, by being drawn by consultants and new regulations toward the measurement of short-term “competitive” performance (e.g. performance relative to specific indexes or narrowly-defined competitors), many fiduciaries have been losing track of their long-term responsibilities to family fortunes. As Warren Buffett may have said: “To finish first, first you need to finish.” And to finish, you must first avoid succumbing to speculative bubbles. Charles Mackay – Extraordinary Popular Delusions and the Madness of Crowds (1841).